In 2013, Redwood City approved Stanford University’s ambitious proposal to develop a 35-acre satellite campus seven miles from Palo Alto. Over the next 30 years, 13 buildings totaling 1.5 million square feet will be developed for administrative offices, research and development, and medical clinic space. The Master Plan includes a day care center, fitness center, restaurants, courtyards, green space and a central unifying plaza. Among other public benefits, Stanford will provide entrepreneurial boot camps and management training programs for Redwood City staff and residents. The campus will have a district energy system, using a central plant to supply hot and chilled water to the campus buildings. Cold-water thermal energy storage, a waterside economizer, and predictive controls to optimize performance based on weather and historic usage patterns will contribute to excellent overall system efficiency. 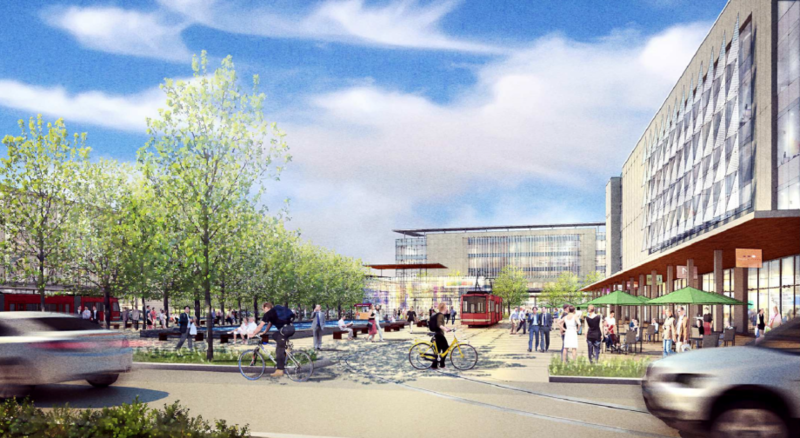 In 2014, Beyond Efficiency was engaged during schematic design for Phase 1 of the development, which includes four office buildings, a childcare center, fitness facility, data center and parking garage. A 130,000 sq.ft. representative building was selected to guide development of the other structures by assessing energy efficiency and cost effectiveness of a range of proposed mechanical systems. Simulations with IES Virtual Environment, a dynamic building energy modeling software that provides the robust capabilities required to analyze complex mechanical systems, showed that standard VAV systems with reheat are the best solution for the campus buildings. Building-level HVAC energy usage consists only of pumps, fans and controls due to the central plant, and other more efficient mechanical system options such as chilled beams have extremely long payback periods that can’t be justified. Since project initiation Beyond Efficiency has remained an integral part of the design team, providing schematic-level and detailed energy modeling to support systems optimization, Title 24 code compliance, and technical support for PG&E's Savings by Design (SBD) and thermal energy storage (TES) incentives programs. We are also facilitating energy benchmarking for the campus. As of mid-2018, the project is under construction.